You are here: Home / Technical Insights / Tire and Rim Fitment: It’s Important! Rod Morris, proprietor of MMP on this website, is sometimes asked about tire and rim fitment guidelines. 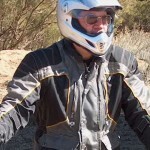 The subject is complex so I’ll confine my remarks to the KLR650 and the DR650. The DR650 comes with 1.85 x 21” front and 2.50 x 17” rear rims. The stock tires are Bridgestone 90/90 x 21” TW41F and 120/90 x 17” TW42R. Despite world standards dictating 2.15 x 21” and 2.75 x 17” rims for the above tire sizes, Bridgestone calls the DR650 fitment combination ideal. Actually, “acceptable” would be more accurate. The KLR650 comes with a 90/90 x 21” front tire mounted on a skinny 1.60 x 21” rim. Out back is a smallish 130/80 x 17” tire mounted on a more acceptable but not perfect 2.50 x 17” rim. The 1.60 x 21” front rim is considered too narrow by world standards for a 90/90 x 21” front tire. Non-aggressive KLR riders who never corner to the edge of the rubber can get by with the narrow front rim on the KLR, but around here we use the wider stronger 2.15 x 21” Takasago XL’s from Buchanan’s. At maximum lean angles a properly shaped contact patch near the edge of a good tire can ensure successful trips through corner after corner. The Skipper, Rod and I have often used 19” front rims on our street DR’s and KLR’s. On my street Top Gun 644 (DR650) I have either a 3.50 x 19” Metzeler Lasertec or a 3.25 x 19” Avon Roadrider mounted on the optimum rim which is 2.15 x 19”. At the rear is a 130/70 x 18” Roadrider or Lasertec mounted on a 3.5 x 18” rim. Rod Morris, who is a very aggressive street rider, has installed a 100/90 x 19” sticky front tire on a 2.50” drop center Takasago XL rim (again from Buchanan’s) and on his stock rear 2.50” rim an equally sticky 120/90 x 17” tire. When you are dragging your foot pegs in the corners you don’t want a narrow and improperly shaped contact patch. 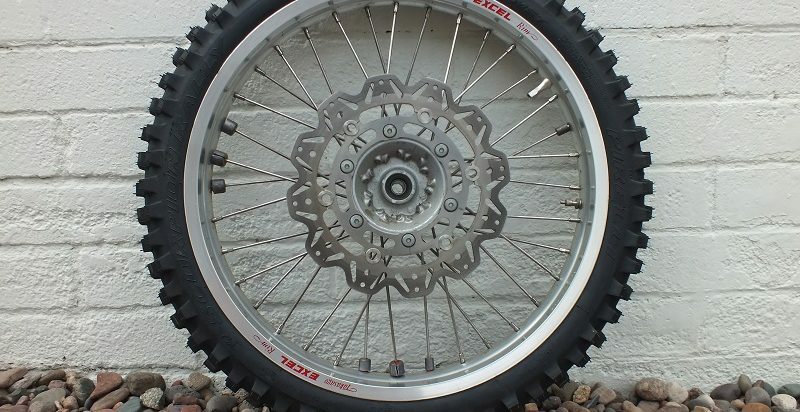 Be advised: going from a 21” front wheel to a 19” front wheel will reduce your rake and trail if you are staying with the stock 650 mm rear tire diameter. By properly raising the front or lowering the rear of the bike, or a combination of both, proper rake and trail can be re-established. Keep in mind that tire diameter and width are critical especially on the KLR which has a relatively narrow and shallow rear wheel well. Anyone who installs a 130/90 or 510 x 17” rear tire and a 2 inch lowering link had best leave the bike parked in the garage or make sure his or her life insurance is up to date. In other words always use a factory diameter and width rear tire and carefully measure your wheel well clearances should you decide to lower the bike with a lowering link. In closing, we at Top Gun found that neither the DR650 or the KLR650 will safely tolerate a lowering link that lowers the bike in excess of one inch, assuming stock rear tire diameters and widths are maintained.